Very amusing video, Think Geek have a review here. Some of the reporting is awfully sensationalist and fear mongering, playing on people’s fears to get a quick, cheap story. There’s a good list of some of the worst examples on the Journalist Wall of Shame. Really quite shocking what’s being said, which is a real shame because it just feeds on people’s misunderstanding of all things Nuclear and will distort the Nuclear debate for years. In addition, this is a nice example of Crowdsourcing to hold “professional” media to account, and an interesting use of Google Docs to allow multiple collaborators produce and update a single document (see second half of the page). Update: The guy who started it has explained his reasons with a link to a list of good Journalism on the subject. So the washing machine died… it had been getting more and more noisy and this morning whilst I was performing my domestic duties it started doing that really really catastrophic noisy thing and massive movement which indicates this is the last spin cycle it will ever do. Clearly a Washing Machine is kind of critical especially with two small boys, and my travel schedule. So thanks to The Internet, a new washing machine will arrive Tuesday – crisis over. And I think we will be able to keep the old one, which will provide a weekend’s worth of entertainment and education for the Boys as we talk it apart – and a very happy colleague who will get the bits for his Heath Robinson projects. But this got me thinking – I want one with a network connection. Which I mentioned on Facebook and someone quite rightly asked “Why”. Status (stage of washing cycle etc. Web interface for administration, user’s manual etc. Service status, warnings of imminent servicing etc. Then I can hook my washing machine up to Nagios, etc. Oh and I want my Dishwasher and Dryer to do this too… and the heating system. Our psychological state allows us to see only what we want/need/feel to see at a particular time. 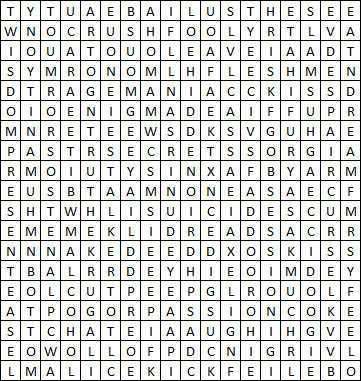 What five words do you see?